Suitable for medium duty industrial and commercial applications. Ideal for bench-top work surface protetction. 6mm thickness, in 910mm or 1220mm widths. Supplied pre- cut, in multiples of 1m length. Working with machinery and fragile goods is a tricky job, so you need to ensure every precaution is taken to prevent slips, so employees can concentrate while working and can work with peace of mind. Our fluted rubber mats are ideal for medium duty industrial and commercial applications, providing a slip-free surface helping to prevent accidents. By making sure you have taken all the precautions necessary the chance of incidences reduces and so should absenteeism, making your work place safer for employees. They are available in two thicknesses; 3mm or 6mm and are available in two widths; 910mm or 1220mm; they are also available in two lengths of 1m or 10m. 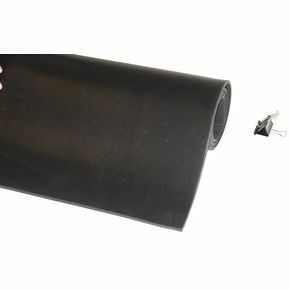 Our fluted rubber matting will provide you with a slip-resistant surface which will help to reduce the chance of someone falling in your work place, making it safer for employees. They are available with a 36 month guarantee for peace of mind.